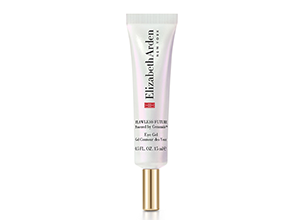 A powerful brightening eye gel that fights the appearance of stress and fatigue around the eyes and instantly brightens for a radiant and wide-awake look. Dispensed by an ophthalmic tip that precisely controls the appropriate amount of product to the eye area. The Flawless Future signature Ceramide, Telosense™ and skin soothers / brighteners complex is boosted with antioxidant vitamin E, intensely hydrating sodium hyaluronate, plus a unique algae extract complex that targets puffiness and dark circles. This is a beautiful, sparkly tube in a nice size. It has a soft fragrance and the product smoothes on without effort – no stickiness! It reduces fine lines and puffy eyes and makes the eyes shine brighter. Looks like this will be a winner!